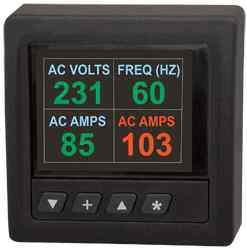 This color LED display instrument provides simultaneous read out of generator output data: AC Voltage, Frequency, Amperage of two legs up to 36 Kw total. Programmable alarm settings on each function produces 85 db audio alert as well as visual red blinking display. It logs cumulative generator operation hours with programmable service interval hour settings and notification. This is ideal for monitoring vehicle mount generator sets and meets NFPA compliance for generator Instrumentation per 1901 22.4.6.3.